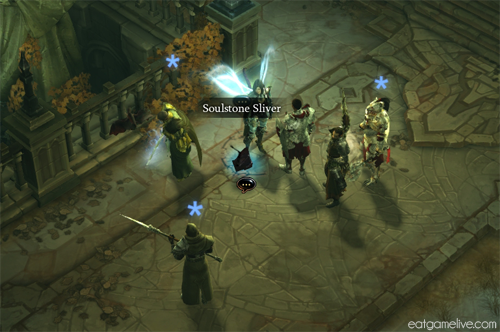 We’re kicking off the new year with a recipe from the upcoming Diablo III expansion: Reaper of Souls. I was fortunate enough to receive a beta key from Blizzard and I immediately wasted no time in doing very important things during the beta test! For example, I’ve only spent 15 minutes talking to Soulstone Sliver in Westmarch. OK, I lied. I probably spent way more time talking to the Soulstone Sliver. I just enjoy watching it spin around to face me when I click on it. I did play through part of the Act V campaign and it’s really creepy. It’s creepy in a good way though. I don’t want to give out any spoilers, but there are encounters that seem very nightmare worthy. I’m still trying to figure out a decent build for my Demon Hunter in preparation for Westmarch. Currently, I’m trying to figure out how to incorporate the new skill “Vengeance” into my build. When I finished the Act V beta demo, I hopped straight into Adventure mode! I think it’s really refreshing because I can travel to any act and collect various bounties. 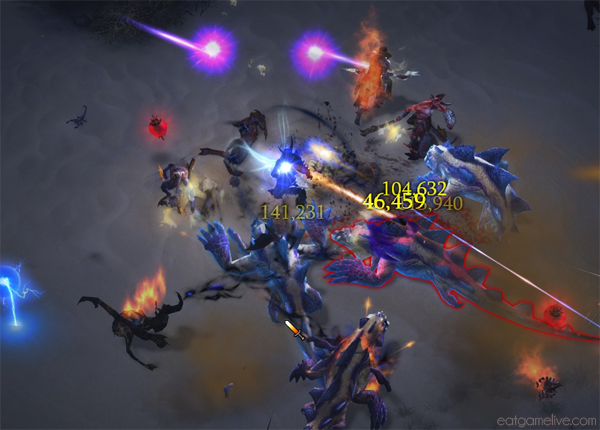 Once you’ve completed all five bounties throughout the act, you’re rewarded with access to the Nephalem Rift. 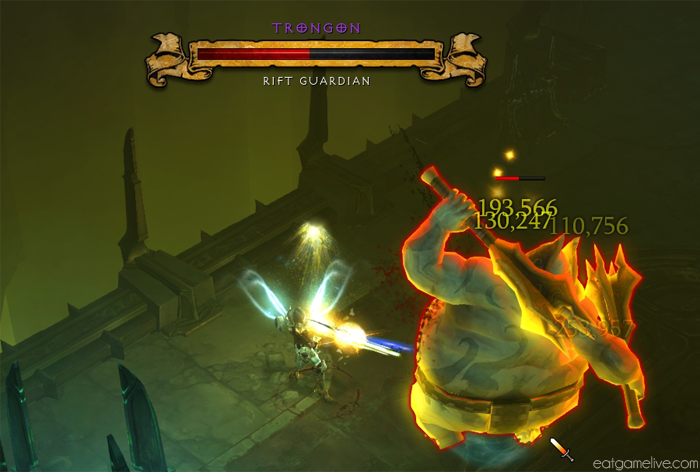 The Nephalem Rift is full of delicious little mobs for you to kill and once you’ve destroyed enough of them, you get to fight a big baddie at the end. And after you’ve slaved away killing all of those darn monsters, you get rewarded with some sweet loot. Hooray! Reaper of Souls is set to release at the end of March, but until then, I guess I’ll have to just make Diablo-themed recipes to combat my RoS cravings. 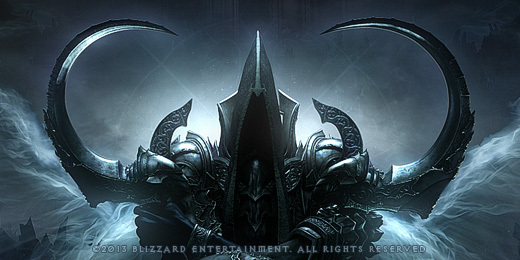 Today’s recipe is the Reaper of Soles, which pays homage to the reaper himself, Malthael. 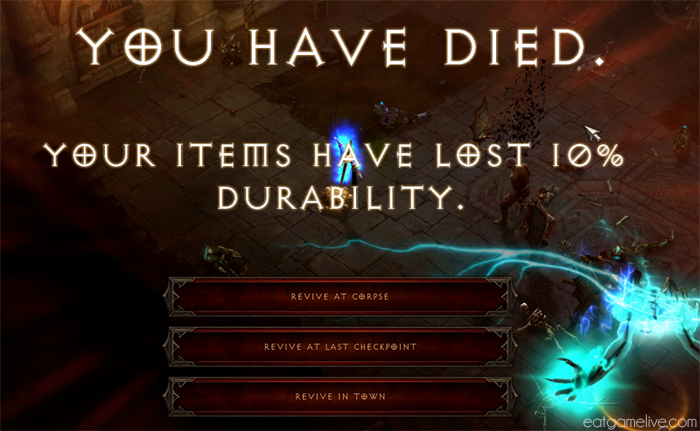 From the Diablo III wallpaper page. Also, currently my desktop background. 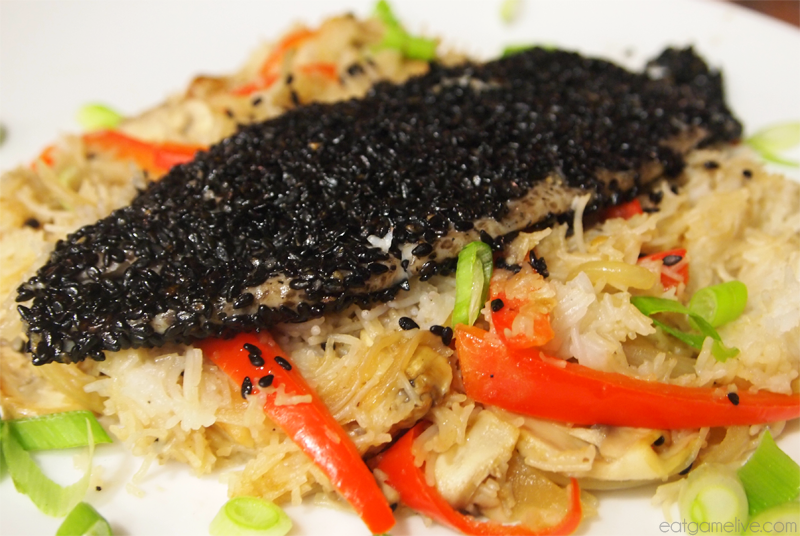 Instead of being cloaked in dark robes, this fillet of sole is crusted in black sesame seeds and was quickly pan-fried on a hot skillet. The fish sits on a bed of souls — err, I mean, a bed of rice noodles. This dish is simple and easy to make, so you won’t have to spend hours slaving away in your kitchen instead of fighting demons in Sanctuary. This dish takes about 10 minutes to prepare, and about 15 minutes to cook. This dish makes 2 servings. Place your sesame seeds in a shallow dish. Season your sole with salt and pepper. Dredge the fish in the sesame seeds. 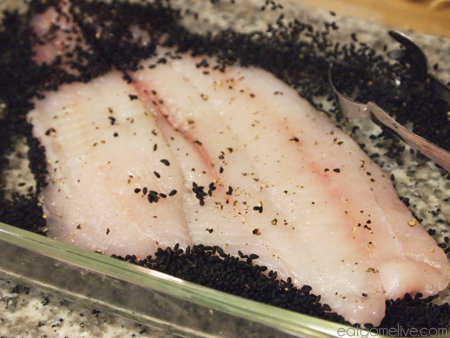 Once the fish is fully coated, remove and set aside. While you are dredging the fish, set a pot of water to boil for the rice noodles. You will want the noodles to cook while you’re cooking the fish. Heat a large skillet on high heat and add in 1 teaspoon of olive oil. 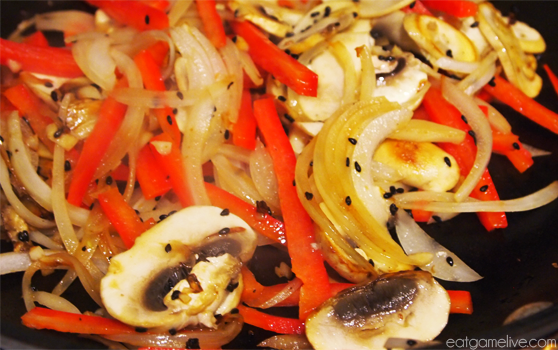 When the olive oil reaches a water-like viscosity, add in your garlic, red bell pepper, onions, and mushrooms. Saute your vegetables until browned (about 4 minutes). Immediately remove vegetables and set aside. Add your remaining teaspoon of olive oil into the skillet. When the skillet comes up to temperature, add in your fish. Allow fish to cook for about 4-5 minutes per side on medium-high heat. While your fish is cooking, add your rice noodles to your boiling water. 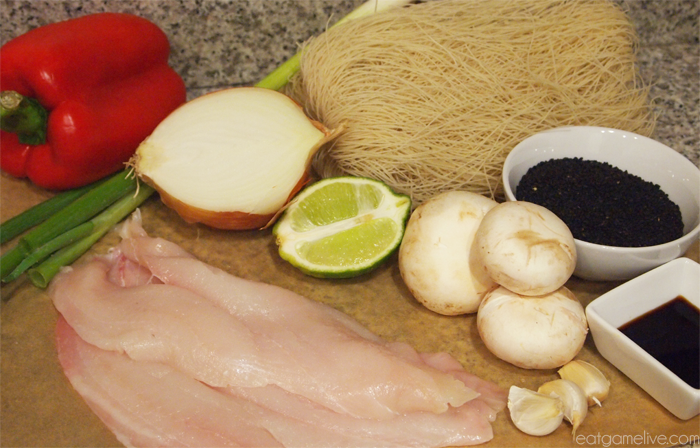 The rice noodles should take about 5 minutes to cook and should finish by the time your fish is done. Stir the noodles occasionally while they’re cooking in order to prevent them from sticking together. When the noodles have finished cooking, immediately strain them and return them to the pot. Stir in your vegetables, lime juice, and soy sauce. Plate your dish by placing your sesame-crusted fish over the noodle stir-fry. (Optional) Garnish your dish with green onions. I hope this dish will inspire you create your own healthy and delicious meals in the comfort of your own kitchen. Hopefully, your kitchen isn’t located in Westmarch because I hear the property value in that place is decreasing due to reapers. 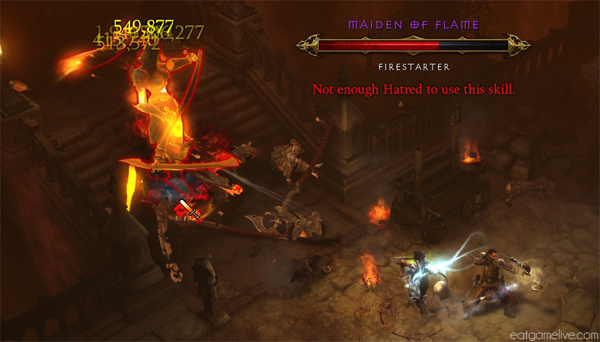 THESE DARN MAIDENS OF FLAME AIN’T NOTHIN’ BUT TROUBLE. This entry was posted in diablo, seafood by admin. Bookmark the permalink. We just featured this on our Facebook page. Unfortunately, I can’t see the image for some reason. i love this recipe too, i found that flounder works really well with this too but instead of skillet frying i give it a 2 hr cold smoke in my smoker with a AMNPS wood pellet smoke generator with apple wood, then finish it in the smoker at 250 deg untill it reaches 160 deg or finish it on a ceder plank on the grill. Thanks for sharing your thoughts about remy martin xo special.